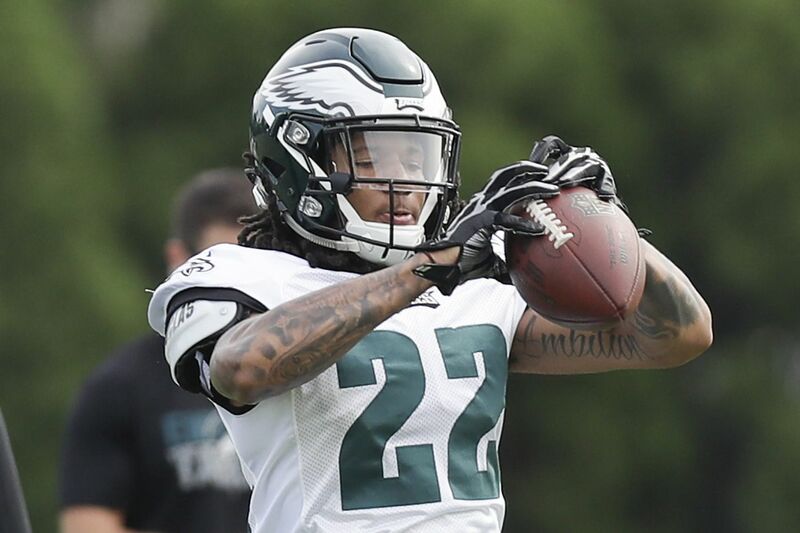 CLEVELAND – There was increasingly some doubt, but when the season opens in two weeks, Sidney Jones will be the Eagles' slot cornerback. No formal announcement will be made, and an injury could alter the plan, but Jones, for all intents and purposes, sealed the job Thursday night. The second-year cornerback got the starting nod, played every snap in the nickel package, and performed well. "Whatever they want me to do, I'm there to do it," Jones said. "Whatever's in the media, I really don't pay attention to it. Obviously, I get tagged [on social media] about [the competition]. But … I just show up and do my job." Jones was credited with just a tackle before exiting late in the first half, but he was part of a defense that allowed just three points and 4 yards per pass attempt. If there was a silver lining in the Eagles' dismal 5-0 loss to the Browns it was the effort of Jim Schwartz's starting unit. And Jones, who held off a late training camp push from rookie Avonte Maddox, showed that he belonged in that group. Is he a natural fit inside? No, not right now. Will he suffer setbacks once the season starts? Probably. But Jones needs to play. He's too talented not to be afforded the opportunity to learn on the job. He didn't win in a landslide, though. On Monday, Schwartz laid out the competition heading into the third preseason game. "Nothing has been settled there," Schwartz said. "Each guy brings a little bit different skill set, a little bit different strengths and weaknesses to the position. I think the competition is good. This game will go a long way to deciding who is going to be out there in the opener." Jones split first-team repetitions with Maddox last week against the Patriots, and the results for both were mixed. But his start against the Browns was a clear indication that the job was his to lose, just as it has been since the beginning of the offseason. The Eagles weren't manufacturing competition when they had De'Vante Bausby share snaps with Jones through the first two weeks of camp. Bausby, a journeyman signed to the practice squad last season, was all over the field during spring workouts. But he faded in the summer, only to be replaced by Maddox. The fourth-round rookie has significantly more experience in the slot than Jones, who had never manned the spot until this year. His future with the Eagles is likely inside and Jones' outside. But Ronald Darby and Jalen Mills cemented the starting outside roles with strong offseasons and Jones will have to bide his time. As far as positional battles go, the slot competition was the best the Eagles had to offer this preseason, which says a lot about the depth of the team. The weakside linebacker job is still up for grabs. Kamu Grugier-Hill started and seemingly moved ahead of Nate Gerry, who was given that chance in the first two preseason games. But the weakside linebacker plays about only 25 percent of downs, and Schwartz could end up using a combination of players based on matchups. The same could be said of slot corner. The 6-foot-0, 181-pound Jones is rangier than Maddox. He should have an easier time against slot receivers with size. The 5-9, 184-pound Maddox has a lower center of gravity and should match up well against shorter receivers. He flashed in the fourth quarter when he intercepted an ill-advised Baker Mayfield pass. "I played alright," Maddox said. "When I first got in I missed a tackle in the backfield. That's not a good thing right there." It remains to be seen whether Schwartz will use both Jones and Maddox. But typically, if you dress on Sundays, the defensive coordinator will find a way to use you. As competent as Maddox looked – he'll play on special teams no matter what – it would have been a mild shock if he had supplanted Jones. The Eagles have a lot invested in the 22-year-old. They selected Jones in the second round of the 2017 draft, knowing he would miss most, if not all, of the season as he recovered from an Achilles tendon rupture. He has first-round talent, but he needs time to mature. Against the Patriots, for instance, he took a poor angle and whiffed in the open field on a play that eventually resulted in a touchdown. But Jones rebounded a week later. In the first quarter, the Browns took advantage of the Eagles' aggressiveness with a variety of trap runs and misdirection passes that advanced them to the 1-yard line. On first down, quarterback Tyrod Taylor tossed a corner fade to receiver Jarvis Landry – a tough assignment – but Jones bodied him up as the ball sailed high and wide. Landry wanted a penalty – as he did two plays later against Mills – but the official just crossed his arms. "I did pretty well against him," Jones said of Landry, who caught only 3 of 10 targets for 23 yards. "He didn't have too many targets. He had a dropped ball in the flat that they targeted him on. Two in the red zone. That was about it. I don't remember him catching too many balls." The offensive turnovers didn't help the defense in terms of field position, but the Eagles responded each time. Jones blanketed Landry on a third-and-long quickie that was tossed wide, and a possession later he tackled receiver Damion Ratley on a third-and-21 dump. Having seen enough of the first-unit defense, coach Doug Pederson pulled his starters late in the second quarter. When the Eagles ran out for the second half, most of the starters were out of pads. Jones was still suited up — clearly for emergency purposes – but he was never needed. Playing him further wasn't worth the risk.